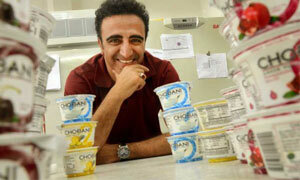 Inc. magazine today ranked Chobani No. 117 on their annual Inc. 500|5000 list, an exclusive ranking of the nation's fastest-growing private companies. The list represents the most comprehensive look at an integral segment of the economy—America’s independent entrepreneurs. This is the first year that Chobani has been recognized on this list as they join other prominent companies like Yelp, Giftcards.com, KIND, and famed hatmaker Tilly’s. America’s fastest growers span 25 industries, all 50 states, and metro areas ranging from Boston to San Diego. New York City had the most honorees, with 350--three more than runner-up Washington, D.C. While nearly half the winners had revenues between $2 million and $10 million, more than 50 took in over $1 billion. In a stagnant economic environment, the median growth rate of 2012 Inc. 500|5000 companies remains at an impressive 97 percent. The companies on this year’s list have created over 400,000 jobs in the past three years, and aggregate revenue among the honorees reached $299 billion. Complete results of the Inc. 5000, including company profiles and an interactive database that can be sorted by industry, region, and other criteria, can be found at http://www.inc.com/5000. "Now, more than ever, we depend on Inc. 500/5000 companies to spur innovation, provide jobs, and drive the economy forward. Growth companies, not large corporations, are where the action is,” says Inc. Editor, Eric Schurenberg.